01/08/2016 – Update v6.3 Darkest Night DLC, Blindfolds, Poker Chip Adding & much more! Happy New Year everyone! Can you believe it’s already 2016? It’s hard to believe that we’ve been around for almost 2 years now, from the beginning to today. It’s all thanks to your great feedback and support that we’ve been able to come so far. We hope you all had a wonderful holiday season and now we can look ahead and see what 2016 will bring us. A lot more people have joined our community from the recent Steam Sale, so we welcome you to the family! Hope you enjoy TTS and be sure to post on our forums if you have any questions, concerns or suggestions! We’ve been back to work this first week and we already have a great update for you with all kinds of goodies! Our next official DLC, Darkest Night by Victory Point Games is now live. This fabulous game can be played solo or up to 4 players. Darkest Night, is a fully-cooperative board game set in a kingdom broken under a Necromancer’s shadow. Each player takes on the role of one of the kingdom’s last heroes, each with a unique set of special abilities, just as they hatch a plan to save the realm. Darkest Night is available for $6.99 with a 20% launch discount for the next week. You can look forward to the 1st expansion in the future which will be included for free. Keybinds have been reset this patch due to adding in the blindfolds hotkey, sorry! We’ve mentioned before that we will be upgrading to Unity 5. At this time, we’re going to put this off a bit so we can focus on some other things that we want to get in first. When we are going to make the jump over, we will let you know so you can be prepared for it. Thanks for your patience. Our latest DLC Darkest Night by Victory Point Games is now available for purchase. The price is $6.99 and will include the 1st expansion in a future update for free. Darkest Night can be played solo or with up to 4 players. Updated the cards with the fixes on the errata, so all cards should now be digitally correct. Separated the starting gear cards from the basic gear cards in each character bag to save a step and labeled them accordingly. Removed the Grid Toggle from the Transient Gear cards. Updated the links for the Rules and Quest Guide on the tablet to the latest version. Fixed one of the enemy decks being placed backwards. 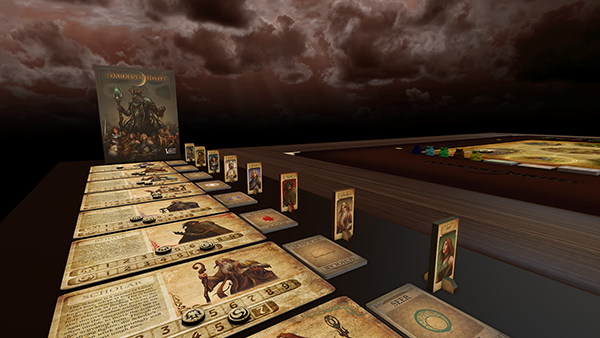 Blindfolds have been added to prevent a player from viewing the board. A player wearing a blindfold can’t see anything but a button to remove the blindfold, the chat and other UI elements. It’s clearly marked who’s wearing a blindfold with an icon next to their name in the top right. To activate the Blindfold, press the B hotkey. A curtain will drop down blocking your view from the rest of the game. You can click the button to take off the Blindfold or press B again. Notifications of the Blindfold are not logged in chat. The names list are hidden when you are blindfolded so that you cannot tell who else is blindfolded or not. The Blindfold is a good way to have everyone “close their eyes” while the host chooses a game or brings out something as a surprise. You now have the option to hide different parts of the UI. To turn off all of the UI, you just press F11. To hide individual parts, go into your Configuration menu and click on the new UI tab. From here you can uncheck the ones you no longer want to show. This can be used to hide/unhide the Top Menu, Player Names, Notes, Tools, and the Chat. 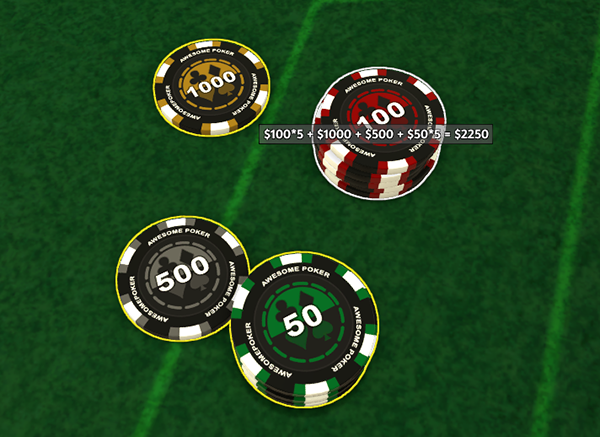 You can now find out the total amount of chips you have by hovering over stacks or drag selecting over all chips you wish to add up. When hovering over a single stack, it will show you the amount in the stack and the total amount of that stack. This will only work for the built in poker chips and not custom chips. You can now split/cut stacked objects just like you can for a deck of cards. Just right click on a stack and click the “Cut” button. The stack will split to the right based on its rotation. Threading has been reset to on for everyone. This will now alert you when threading fails and will turn if off automatically. Vista & XP threading issues should be fixed. If you have done the above and are still having issues, send an email with your DxDiag to berserkgames@gmail.com. A settings button has been added next to the chat tabs. If you want to keep the chat on screen at all times, just uncheck the new “Auto Hide Chat” box. You can also change the size of the font and the opacity of the chat window. Changing the size of the chat window will persist until you change it again. Special characters in names will be stripped out so players can properly join the global chat. Global chat will no longer clear when you exit a game. You can disable global chat by unchecking the “Connect to IRC” box. Added tooltips to the different tabs, so whatever the name is will show up when hovered over a tab. Fixed issue with Notebook not working properly when switching games. Fixed issue with not being able to edit/delete or save tabs in the Notebook. 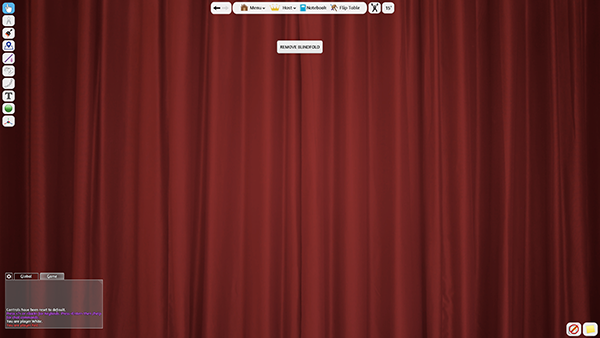 Optimized scrolling of the server browser. Fixed browser font so it’s all the same size. Added tooltips that shows the full names on the server when hovered over. Disabled leading 0’s on digital counters to reduce accidental ambiguity while reading upside down numbers. A confirmation popup has been added asking if you are sure you want to quit Tabletop Simulator. Added the Blindfold hotkey and removed the Team Chat hotkey (since we have tabs now) to the Control Scheme (?). Server browser error messages have been moved to the Global Chat tab. Added messages with C++ Redist info to the chat for those that have issues and need to have this re-installed. Improved bad controller input rejection system. Fixed issue with held object clipping when grabbed below the table. Fixed orange colony marker tooltip to read properly. Fixed issue with Vector lines not saving on objects properly when placing and removing from bags. Fixed issue with saved games crashing from using a non-standard JPG format. Fixed issue with rotated cards being cut off in ALT Zoom. Fixed Y axis collision bug with hex and circle tiles.